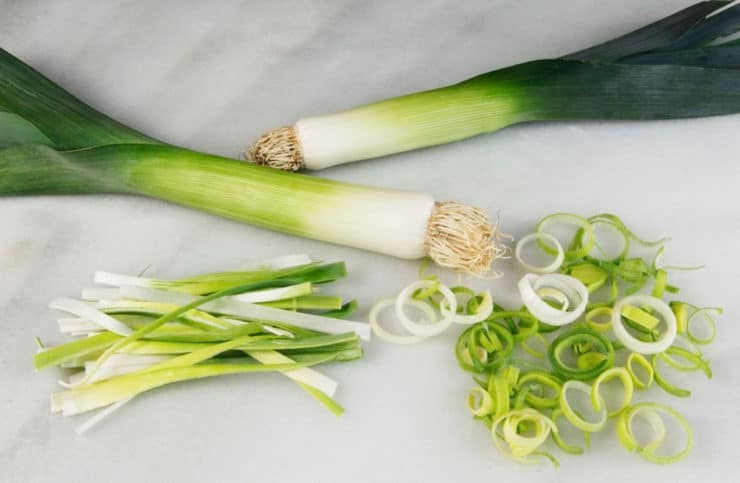 How to Clean and Slice Leeks – Learn to clean and slice leeks, removing dirt and debris from the inner layers and slicing into rings or thin strips. Clear photo tutorial. Leeks are members of the onion family. Both the classical Romans and Greeks were very fond of leeks, in particular the Roman Emperor Nero who earned the nickname Porrophagus, or “leek eater,” after he took to eating them in large quantities in order to improve his singing voice. The Greeks and Romans praised leeks, while deeming garlic and onions fit only for the less fortunate. The ancient Roman cookbook Apicius includes 4 individual recipes for leeks, while only calling for garlic and onions in small quantities as flavorings. Today onion and garlic are a building block in most savory recipes, whereas leeks are not nearly as common. Times have certainly changed! Some historians believe that the Romans introduced leeks to Britain and eventually Wales. 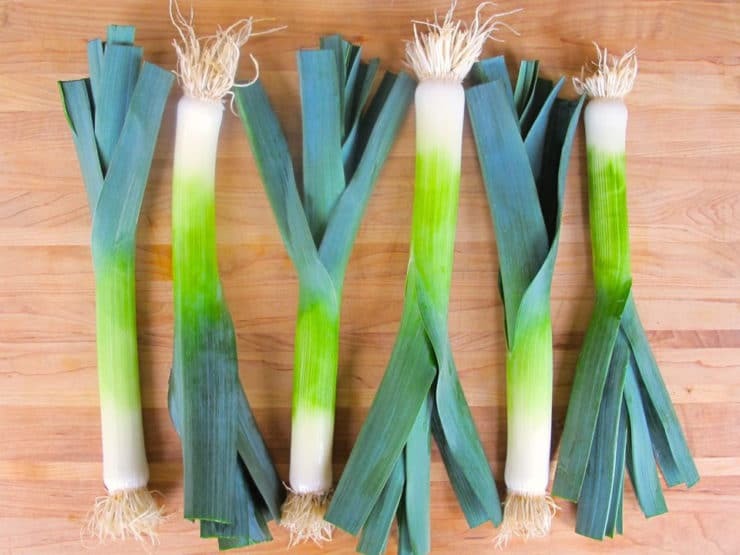 An old tale claims that the Welsh, who made leeks their “national emblem,” tucked raw leeks into their hats during the 7th century Battle of Heathfield so that the soldiers could easily distinguish between their allies and enemies. 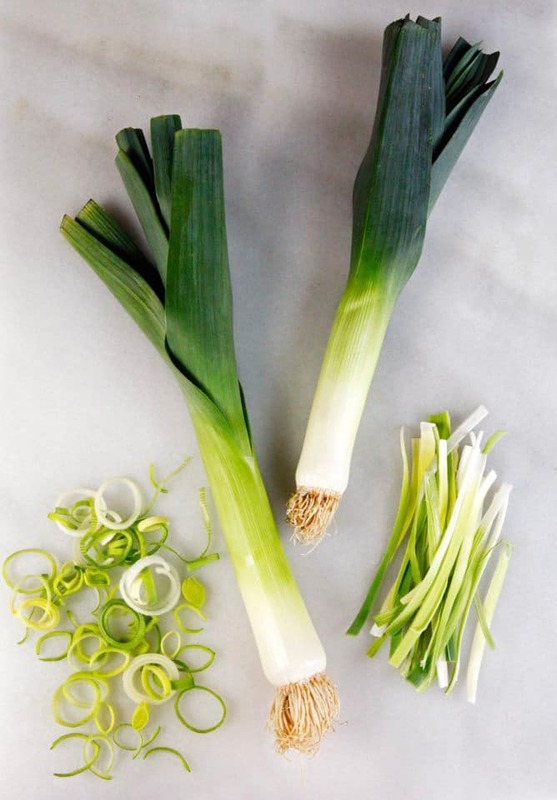 Did the Welsh triumph over the Saxons due to their own strength, or because the powerful odor of raw leeks helped them to know friend from foe? We may never know. What we do know is how to prepare leeks for use in recipes! The challenge with leeks is the dirt and debris that gets caught inside their many layers and leaves. 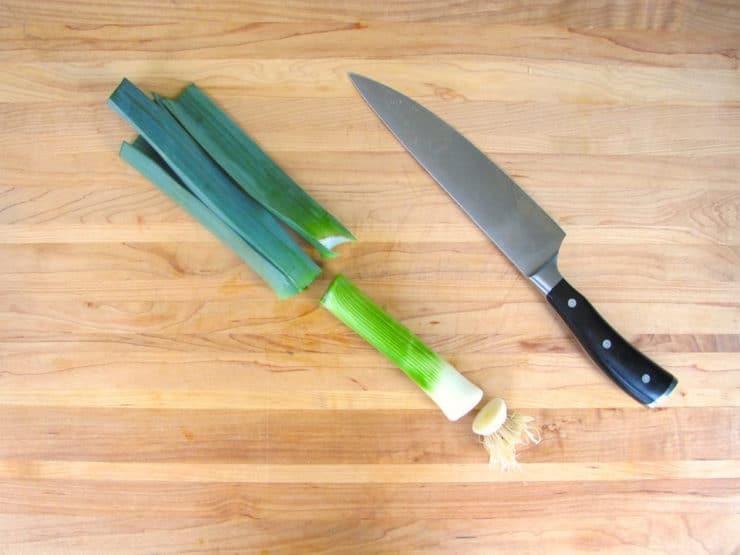 There is a simple solution to getting all of that dirt out and slicing your leeks for cooking. All you need is a sharp knife, a bowl of water, and a colander. Here’s how! Thoroughly rinse your leeks and pat dry with a paper towel. 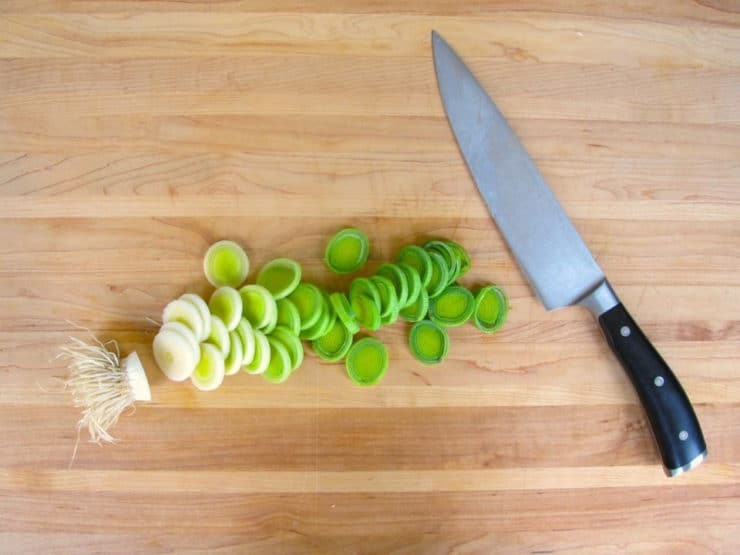 With a sharp knife, remove the dark green leaf end and discard or save for soup or stew stock. Thinly slice the leek into rings and discard the root end. 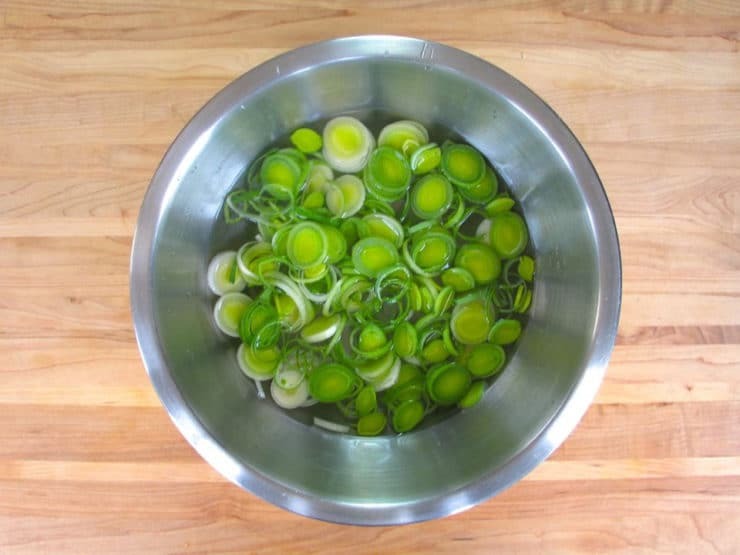 Submerge the sliced leeks in a bowl of cold water. Give them a gentle stir or shake to remove any soil or grit between the layers. Allow the leeks to sit in the water for a few minutes. Then scoop them into a colander using your hands or a slotted spoon. This ensures that you aren’t dumping the rinse water back onto the leeks. Now you have clean, sliced leeks that are ready to be used. Alternatively, if you prefer, you can slice your leeks into thin strips by first removing the dark green leaf ends and the root ends. Discard or reserve these for soup or stew stocks. 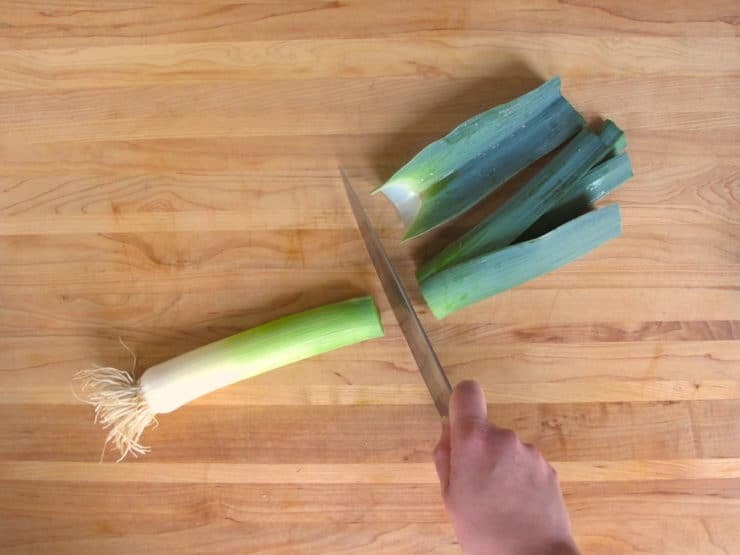 Then, slice each leek in half from top to bottom. Slice the halves into thin strips. 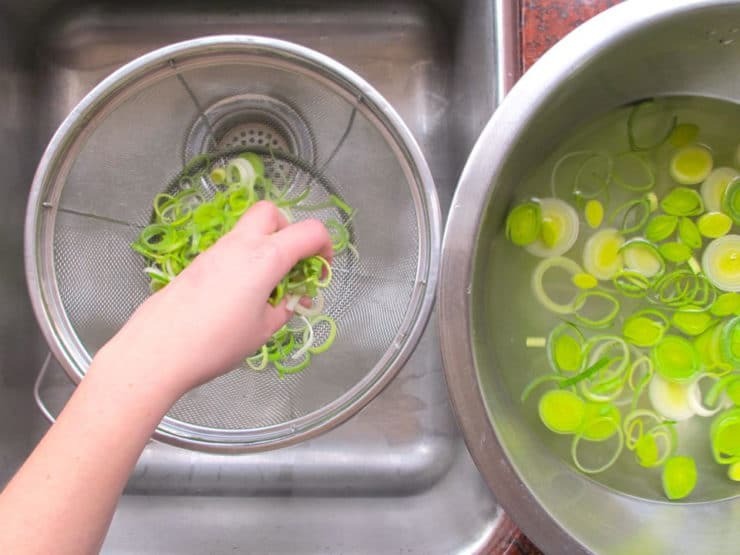 Then rinse in a bowl of water the same way you would with the rings, scooping them into a colander to drain. There you have it! 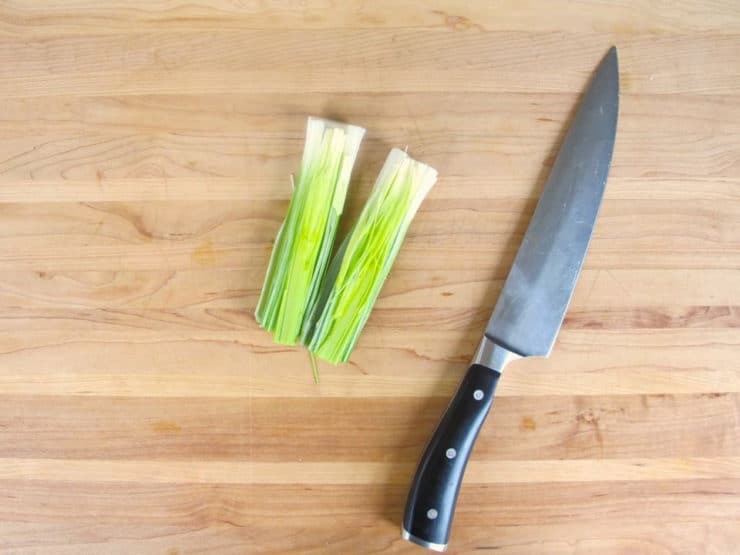 Clean, sliced leeks that can be used in a variety of recipes. Rupp, Rebecca. How Carrots Won the Trojan War: Curious (but True) Stories of Common Vegetables. North Adams, MA: Storey Pub., 2011. Print. Very handy, very well laid out. I can smell them cooking now… Thanks… will be looking for a good vegetable stock recipe!! My first time using leeks. Thanks so much for all the helpful hints. I am a newbie cooking with leeks for the first time. The tutorial was very helpful. I appreciate the comments an d suggestions. bok choy in my meals more often. This sounds amazing! post your recipe if you would! I started trying leeks on “The Daniel Fast” and found out how good they are. Today I plan to fry some Collard Greens, Cabbage and Leeks! Just came here to see if there are different ways of cleaning them. I think I will slice them length-wise. I know this is an old post, but I too am a newbie in regards to leeks and your info as well as the comments have been very informative. I suspect I will be purchasing more leeks in the future!. Not sure about that Peter, I can’t say I’ve ever used that part before. Use the thick green leaves as you would a bay leaf or put them in a spice bag and pull it out before serving. I use coconut oil instead of butter. This is the first time I’ve had a recipe that calls for leeks. This tutorial was absolutely perfect in describing step by step on how to properly handle this vegetable. Thank You. Super helpful tutorial, thank you so much! I never thought of slicing the leeks in rings and then cleaning them. My veggie soup just got more appealing. Thank you for the tip. Other than in soups, I use leeks steamed with carrots. EASY and delicious – and no need for anything else – unless you insist. My family also likes the steamed leeks/carrots cold the next day. IT SEEMS LIKE SUCH A WASTE TO THROW AWAY THE GREEN LEAFY ENDS. DOES ANYONE EAT THOSE TOO? AND IF SO HOW WOULD YOU PREPARE THE ENDS? THANKS! Love leeks. Easy to grow. Never knew that the dark green part could be used in soups. We always have composted them. With the snow storms coming our way, this gives me an idea to make potato leek soup. Yum! I am 77yrs old and have prepared leeks for soups all my life. First, I take a sharp knife and trim ends off both the bulb and the leaves, removing the outside layer of skin if it dry or damaged. I never cutoff entire dark green leaves, only trim ends. I then take the knife & slice lengthwise from bulb end on down through green leaves. I carefully turn bulb end in my hand and again slit lengthwise, either once or twice depending upon the thickness of the bulb. Also slit further down where the leaves may still be wide. 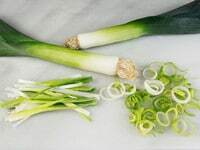 Then take kitchen shears and snip the prepared leeks in 1/2 ” cuts, starting at bulb end, into a clean sink filled with fresh warm water. 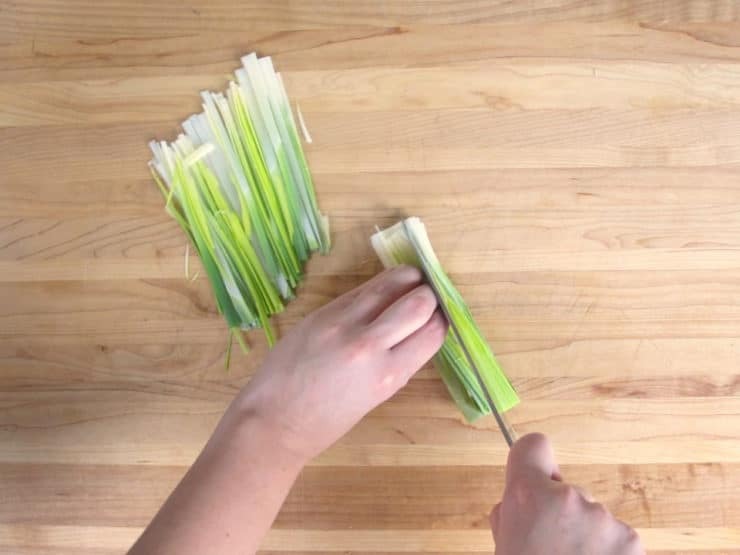 Soak then rub snipped leeks together to loosen any dirt, which will sink to the bottom. Using a slotted lifter, remove cut leeks into a large strainer, then bag into freezer Ziploc bag(s) and store in the freezer until ready to add to soups. Parsley maybe prepared in a similar fashion, as parsley stalks are very flavorful when added last to homemade soup recipes. Having frozen prepared leek & parsley saves a lot of time when making your favorite soups. Thank You Anne Twigg. Great to know how to freeze them. Great to know that they freeze well without any blanching. And thanks for the details on how you clean and prepare the leeks. Leeks are delicious in many ways and definitely add so much flavor in my chicken soup!!!! When I was a chef in Miami, if you didn’t clean leeks correctly you got fired! Rinse, rinse, buy frozen and cleaned! Leeks are great! We use the dark green part too- there’s no reason to throw it away, especially is soups and stews. Leeks are great to use as a substitute for onions in dishes if you have an intolerance for onions. They’re also great sauteed with olive olive oil, and cottage cheese, in between phyllo dough like a greek pie. I love leeks in a whole lot of things, but have to laugh at checkout when I get the look like what in the world are these and then the long run through their index book until I finally tell them, they are leeks. Same with bok choy…:). Leeks are one of my favorite ingredients! Can’t wait to see what you cook up.